Back in the 1970s, planetariums across the country found themselves with a hit on their hands. No, it wasn’t the traditional tour of the Milky Way—it was the laser light show. Productions like “Laserium” reached millions of people with their groovy meldings of laser spectacle synched to the latest hits from hip bands like Pink Floyd and the Electric Light Orchestra. And if you don’t think “Laserium” was “high” on science, think again: The show had its origins in Elsa Garmire’s Caltech lab. 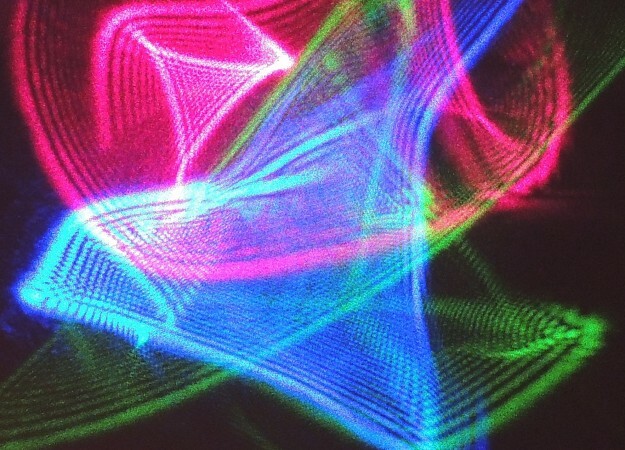 Garmire and science historian Patrick McCray join Ira to tell the story of how Garmire’s artistic experiments with lasers launched a ‘70s trend. 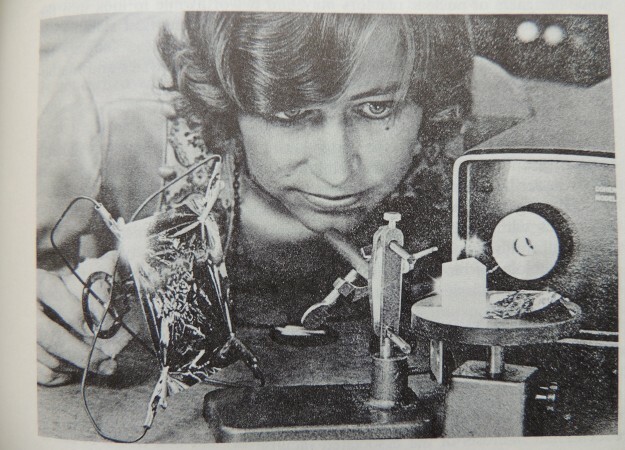 Dr. Elsa Garmire watches on as one of her laser light shows is filmed in the early seventies. 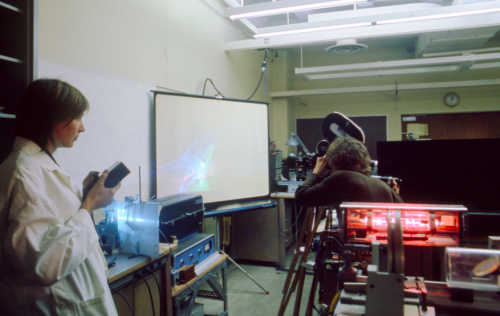 Ivan Dryer, who took this picture at Caltech, would go on to become the CEO of “Laserium”. 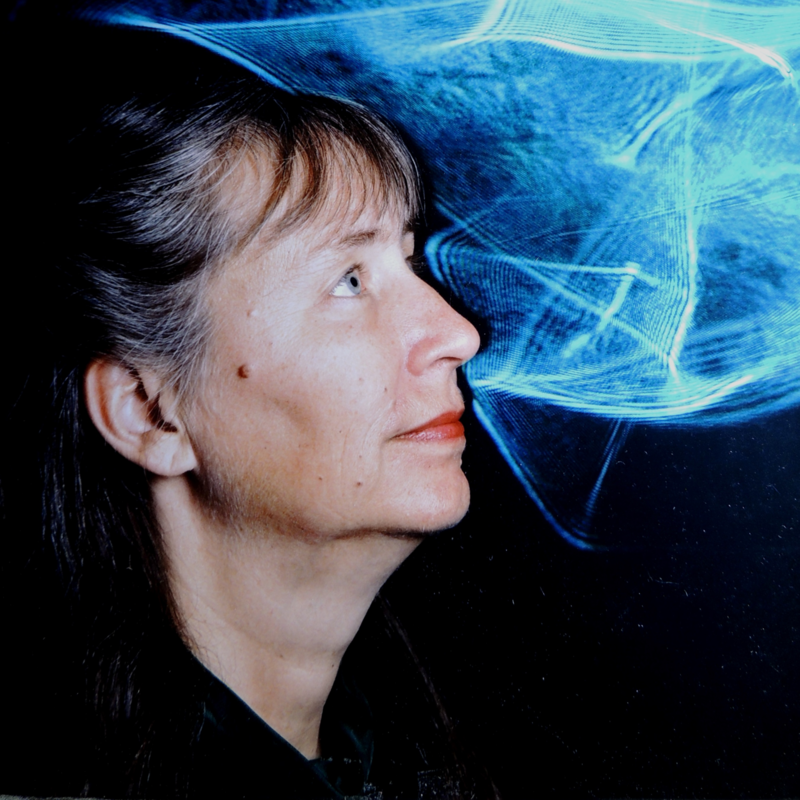 Elsa Garmire is the former president of The Optical Society, and is the Junkins Professor of Engineering at Dartmouth College in Hanover, New Hampshire. IRA FLATOW: This is Science Friday, I’m Ira Flatow. Imagine. It’s a summer night in the 1970s. And LA’s Griffith Observatory Planetarium is packed. But this crowd is isn’t here to see the Big Dipper. No, they’re waiting for a different kind of spacey spectacle to begin, the laser light show known as Laserium. ANNOUNCER: The atmosphere is one of a concert. But this time it will be a concert for the eye as well as the ear. IRA FLATOW: Pink Floyd plays on the speakers, while multicolored lasers trace circles and strobing patterns in time with the tunes. Remember back then? Well, today that iconic laser show may feel like a quirky ’70s relic, like macrame or disco. We take lasers for granted. Even your computer mouse has a cheap laser in it. But in the ’70s, lasers were new and wondrous and seriously far out. And the Laserium? It had its origins in Dr. Elsa Garmire’s physics lab. Here to tell the story is Dr. Elsa Garmire. She’s the Junkins Professor of Engineering at Dartmouth College and a former president of the Optical Society. She joins us today from Hanover, New Hampshire. Welcome to “Science Friday,” Dr. Garmire. DR. ELSA GARMIRE: Good morning or good afternoon, Ira. IRA FLATOW: And Patrick McCray is also with us. He’s an historian at the University of California Santa Barbara and co-editor of a forthcoming book, “Groovy Science.” I love that title. He wrote about the Laserium on his Leaping Robot blog. Welcome back to “Science Friday,” Patrick. PATRICK MCCRAY: Thanks Ira, it’s nice to be back. IRA FLATOW: Dr. Garmire, take us back. Take us in that Wayback machine to the late ’60s, the early ’70s. Why were physicists like yourself so excited about lasers? DR. ELSA GARMIRE: Well, the laser had a characteristic that no other light has called coherence. And that means that it sparkles. When you look at the laser light reflecting off a wall, you see real sparkle. And that only comes from coherent light. It also would go in beams, a bit like the old-fashioned carbon arc lamps that they used to have for Hollywood. But now these beams are small and beautiful. IRA FLATOW: I remember they could blow holes in razors. They used to describe it as how much Gillette power your laser had, remember? DR. ELSA GARMIRE: That’s right. The very first laser demonstrated was a ruby laser. And it put out a tremendous amount of power. It was completely unpredicted. And it was quite a surprise when it put out so much power that it could blow holes in materials. And it can even ionize the air. IRA FLATOW: Patrick, lasers had a cultural mystique, too, right? PATRICK MCCRAY: Yeah, I think it’s important to remember like Elsa was saying that in the 1960s lasers were very rare sorts of things, that you would oftentimes just see in the laboratory. So one of the great things about Laserium was that it helped popularize the laser itself, for a much wider audience. IRA FLATOW: And then “Star Wars” came in the ’70s and made it big. PATRICK MCCRAY: Exactly. Everybody wanted a light saber, including me. 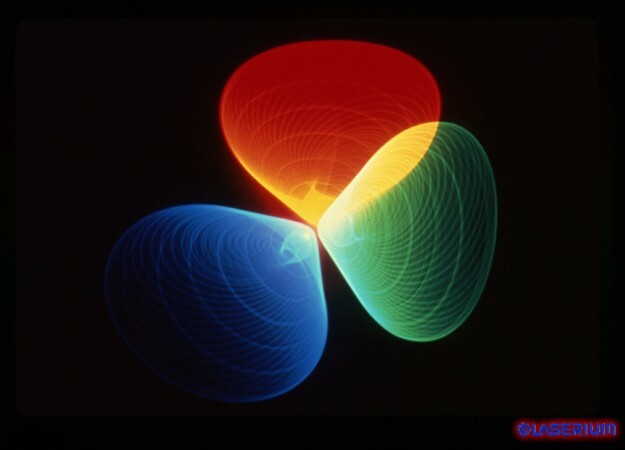 IRA FLATOW: Elsa, what got you thinking, hey, maybe I could make art with lasers? DR. ELSA GARMIRE: There was an organization called Experiments in Art and Technology that started out with a combination of artists in New York and Bell Laboratories that put on a very famous event, called “Nine Evenings.” And from that developed the opportunity to build a pavilion in “Expo 70” in Japan. And I was asked to be a part of that, because they had optics. And I’m an expert in optics, and they wanted me to work with them on building the world’s largest hemispherical mirror, which we did. 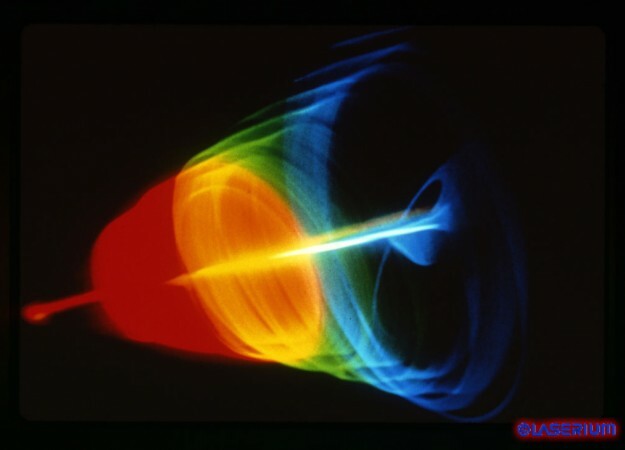 IRA FLATOW: And one of your early laser art experiments I understand required a trip to the bathroom plastics supply store. DR. ELSA GARMIRE: So having met some very prestigious artists from New York, I got to asking myself, if I were to be an artist, what would be the characteristics of lasers that I would want to use in my art work. And I decided that they were pretty, and that was a characteristic that I liked. So I wanted to make beautiful patterns. And I discovered that if you put transparent materials that have some structure in them, like bathroom shower stalls that were popular in those days, you could make very beautiful patterns using the laser. In those days, the only cheap laser was a helium neon laser. And even that was $1,000. So it wasn’t something you did in your house really. But I could use the lasers from our laboratory at Caltech and experiment around. And I found a way to make these very beautiful laser patterns. IRA FLATOW: I understand that your super secret laser art technique uses Duco Cement. Now you have to be of a certain age to remember Duco Cement. It’s sort of like airplane glue, if I remember it correctly. DR. ELSA GARMIRE: Well, believe it or not, it’s still sold. 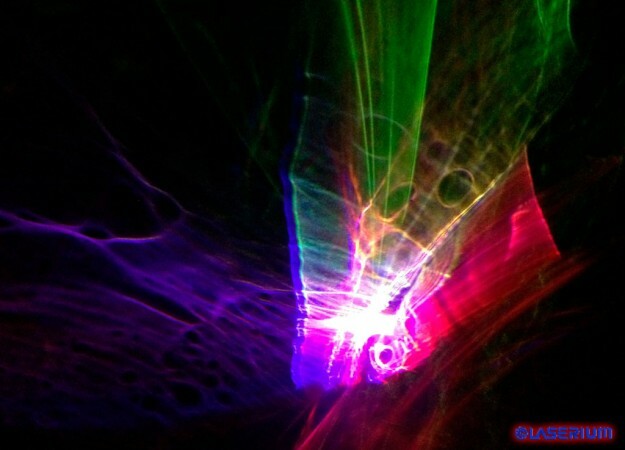 I just got started making these laser light show pictures again. Suddenly, people are aware of the time that’s passed, and they want them. And I found my old glue wouldn’t work after 40 years. So I had to make new diffusers. And so I set my husband off, and he came back with some Duco Cement. So anybody could get it. IRA FLATOW: Patrick, how does laser art make the jump from Dr. Garmire’s lab to the Planetarium? PATRICK MCCRAY: Yeah, that’s a really interesting story. So one of the people who saw some of Elsa’s work in Los Angeles was a member of the name of Ivan Dryer, who had worked at the famous Griffith Observatory. And he originally showed up at Elsa’s lab, and he wanted to film some of the laser images that she was producing. But he soon realized that filming these was inferior to seeing them in person. So Ivan and Elsa put together a company called Laser Images Incorporated. And riffing on the word planetarium, they called their Laserium. And finally, after much perseverance, in November 1973, Ivan Dryer had the chance to debut Laserium at Griffith Observatory, which was a huge success. Soon they were turning away hundreds of people every night. IRA FLATOW: Mhm. And in the early days, laser shows were performed by laserists, right? What is a laserist? What does he or she do? PATRICK MCCRAY: It’s really interesting. I mean, the people oftentimes forget, but the laser show was actually a live show. There was a laserist, and he or she could actually control the beams and actually acted as a composer of sorts for each Laserium show. So this person would sit at a console and sort of work a visual synthesizer. And the main Laserium office would provide a master program for the laserist, but the person could then actually modify that, according to the crowd’s reaction, the kind of music they were playing, and as well as their own skill and imagination. IRA FLATOW: And the Laserium became very successful around the country, didn’t it? How popular was it? PATRICK MCCRAY: Well, by 1976, already over two million people had seen shows. And planetaria in Los Angeles, in Denver, in San Francisco, in Chicago all had places where you could see it. And the music, of course, was a huge part of the appeal. You opened the segment with some Pink Floyd, I believe. But interestingly enough, it was classical music that they first used at the early shows. In fact, the very first piece of music that played at the opening Laserium show was Aaron Copland’s “Fanfare for the Common Man.” But gradually that shifted to Pink Floyd and Emerson Lake and Palmer and some of the trippy prog rock of the 1970s. IRA FLATOW: Elsa, were you prepared for how big this got? DR. ELSA GARMIRE: Well, I’ll tell you. I loved it. I loved the classical music. And when they switched to the rock music, that’s when I decided to absent myself. IRA FLATOW: Well, there’s just so much Copeland you can do. And Patrick, did you react the same way? Or were you happy with the rock music? PATRICK MCCRAY: I saw the first shows in the 1980s. And you know, I certainly enjoyed it. But I also probably wasn’t as chemically enhanced as some of those people in the 1970s were, when they saw some of the Pink Floyd shows. IRA FLATOW: I like the way you phrased that as chemically enhanced. You’ve compared the laser light show to 19th century science demonstrations. Why do you make that connection? PATRICK MCCRAY: Yeah, it’s interesting that Laserium debuted at a public planetarium. Because these, of course, have a long history of educating as well as entertaining people. And this tradition goes back all the way to the 19th century, when there were public displays of electrical effects that people like Michael Faraday and Nikola Tesla would do with great flourishes and showmanship. And Laserium is sort of a continuation of that tradition, that combined an educational component, where people could see and perhaps learn about lasers, as well as with the obvious entertainment value. IRA FLATOW: Mhm. Elsa, tell us what your early Laserium photos– the pictures you were drawing, the images. What did they look like? DR. ELSA GARMIRE: It’s hard to describe them, because they are unique. But they were a bit wispy. And the light gets spread out in a kind of a wispy pattern, but the pattern has structure as well. So it’s something that is not really easy to explain if you haven’t seen it. I have sent some of my Laserium photos to be able to go on the website that you guys have and are going to have up, so there is a way for people to look at them. IRA FLATOW: I understand you’re making new laser art right now. Can we try this kind of stuff at home? DR. ELSA GARMIRE: Yes, I did not patent my idea. I’m a great believer that people should do it. In fact in 1971, I suggested that there could be a home laser light show, and I demonstrated it on television. But nobody wanted to buy it, because the lasers themselves were not cheap. It would have been the equivalent of about $2,000 these days. And nobody was tripped out enough to spend that kind of money. IRA FLATOW: But now we have the pointers. DR. ELSA GARMIRE: That’s right. IRA FLATOW: Those little red laser pointers are very cheap. DR. ELSA GARMIRE: So a red laser pointer and a green laser pointer is all you need. You can also get laser pointers in other colors. And if you send these lasers through– we call them diffracting materials, these are the transparent materials. They’re clear, but they have patterns in them. They are usually plastic that have patterns. Or you can get a glass slide and put some Duco Cement on it. And when you do that, it will get air bubbles. And the air bubbles will diffract the light. And that works as well. I did want to say however, that many of the lasers that you can now buy on the web are dangerous. They’re too powerful. And if you’re a parent, you should be very careful about letting your kids just order lasers online, without looking carefully to see if they’re safe. IRA FLATOW: Here you go. So you have a project to try at home. I’m going to try this. I have laser light pen. I certainly know where my Duco Cement is, underneath all my airplane models. So I’m going to see if I can squeeze out a little blob of that stuff. Thank you both for taking time to be part of our program. It’s been a real blast from the past, as we used to say. PATRICK MCCRAY: Excellent, thanks Ira. IRA FLATOW: Elsa Garmire, Junkins Professor of Engineering at Dartmouth and former president of the Optical Society. Patrick McCray is a professor of history, University of California Santa Barbara, co-editor of the forthcoming book, “Groovy Science.” And if you want to real blast from the past, you can head over to our website at ScienceFriday.com/laser. We’ve got lots of groovy pictures of the Laserium over there. Stay with us, we’ll be right back after this break. Patrick McCray wrote about the history of Laserium on his “Leaping Robot” blog (@LeapingRobot).